Home CDN , children , crafts , feature , holiday , holidays , homeschool , January , papercrafts , printables , US , worldwide January 30th - Featuring Beatles Freebies! January 30th - Featuring Beatles Freebies! -- There are moments in time which cause us to stop and take notice of where we were and what we were doing when they happen in order to commit the experience to memory — how it made us feel, who was there with us, why it felt important. January 30, 1969 was one of those moments. There are those who were on the periphery of the event that day and heard what was going on; but as one of the few remaining insiders who accompanied the Beatles up onto the cold windswept roof of the Apple building, Ken Mansfield had a front row seat to the full sensory experience of the moment and witnessed what turned out to be beginning of the end. Ken shares in The Roof: The Beatles Final Concert, the sense something special was taking place before his eyes which would live on forever in the hearts and souls of millions. 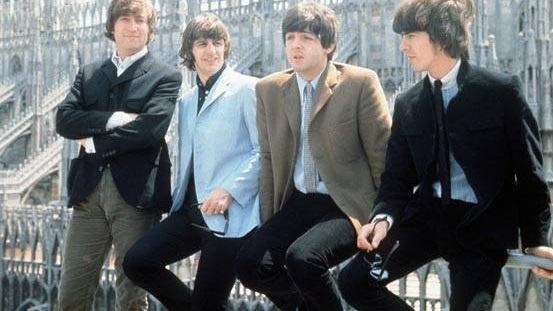 • The Beatles on the Roof -- At lunchtime on a bitterly cold January day in 1969, the strains of guitar chords could be heard in the streets surrounding London's Savile Row. Crowds gathered – at ground level and above. People climbed onto roofs and postboxes, skipped lunch to gather and listen: For the first time in more than two years, The Beatles were playing live. Ringing from the rooftops, disturbing the well-to-do ears of the tailors below, they upset the establishment and bewildered the police. It was filmed by director Michael Lindsay-Hogg, who hoped the footage would act as the finale to a celebratory TV special. • The Beatles Anthology Box Set -- The Beatles' story as told by the Beatles themselves. The original 8 VHS tape set spans four DVDs. The 5th disc contains rare and never-before-seen footage exclusive to this DVD package. Newly mixed in 5.1 surround sound with picture restoration. - On this day the Beatles performed together in public for the last time in 1969. The show took place on the roof of their Apple Studios in London, England, but it was interrupted by police after they received complaints from the neighbors about the noise. - While the Larousse Gastronomique pits the pastry as originating in 1686 Budapest, other historians refute this as a colorful tale, arguing the French croissant as we know it is a more recent invention, recorded in France as early as the mid-1850s as a crescent-shaped bread or cake. The Oxford Companion to Food argues it wasn't until 1906, in Colombie's Nouvelle Encyclopedie culinaire, a true croissant, and its development into a national symbol of France, [emerge as] a 20th-century history. - So get out your lederhosen, head to your neighbour's front porch, and let out your best yodelayeehoo. Then you better start running! - The only president to serve more than two terms, FDR was elected four times. He supported the Allies in WWII before the US entered the struggle by supplying them with war materials through the Lend-Lease Act; he became deeply involved in broad decision making after the Japanese attack on Pearl Harbor December 7, 1941. - In Londonderry, Northern Ireland, 14 Roman Catholics were shot dead by British troops during a banned civil rights march. During 1972, the first year of British direct rule, 467 people were killed in the fighting. - Indian religious and political leader, assassinated at New Delhi, India on January 30, 1948. The assassin was a Hindu extremist, Ram Naturam. - A day to end those numerous, annoying inane answering machine messages. We all get them on our answering machines. An inane message is a senseless or meaningless message, or a prank call. Or, it could be an insane message.